The Project geology is characterized by the Thatuna Batholith, a granitic intrusive of Cretaceous age, composed mainly of Na-feldspar, K-feldspar and quartz. The mineral deposit is the overprinting of the intrusive rock by a weathered saprolite horizon which directly overlies the bedrock from which it was derived. During the natural processes of weathering, the original plagioclase feldspars have preferentially broken down to produce the clays kaolinite and halloysite. The K-feldspars have resisted weathering to a degree and much of the original component remains as free grains. Similarly, the quartz component of the host rock remains as free grains in the weathered material. The mineral resource products include kaolinite, halloysite, K-feldspar and quartz. The exploration programs supporting the mineral resource estimate consists primarily of diamond core drilling, sampling, chemical analysis and material characterization studies. The drill hole database supporting the resource estimation of this report consists of 322 diamond core drill holes totaling 35,909 ft. The drill holes average 112 ft in length, all are oriented vertical and spaced on 100 to 200 ft centers. The original assay sample lengths generally range from 5 to 10 ft with an average of 5.8 ft. Analytical testing consists primarily of material characterization studies used to support the resource estimation of this report. This work involved two general areas of study including particle size analysis and clay characterization. 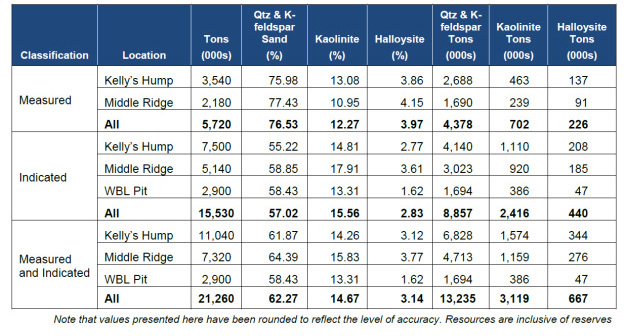 The mineral resource statement completed by SRK Consultants (USA) Inc. is presented below.